This dialog will go away next week. The first time that you launch LibreOffice a dialog is presented which displays a quick summary of all things changed since our last upgrade of OpenOffice. I have used this in the past with OpenOffice and found it to be very helpful. No one reads the published articles and email messages about upgrades, but here it is again. We then have acknowledgement that they clicked through. 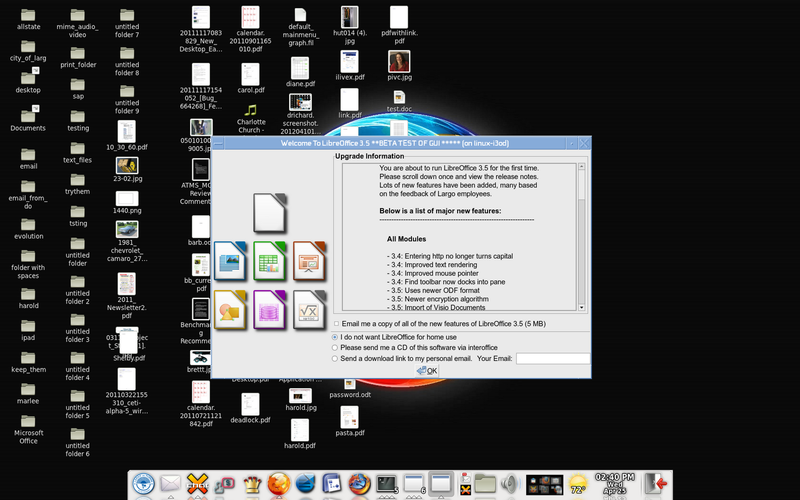 The dialog gives them the option to receive a PDF of all release notes. It also gives the users the ability to have a document emailed to their home address with the download links of LibreOffice; or if they want we will burn them a CD with the software already downloaded. 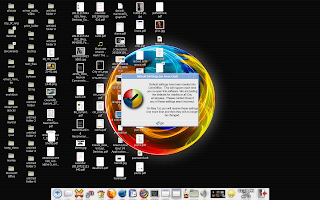 It's proven very helpful to promote people running these same software packages at home on their computers. 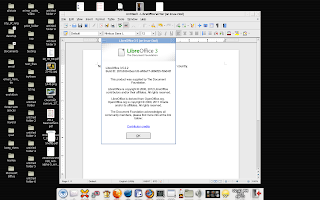 And then LibreOffice launches normally and quickly. While you don't really ever have a "cold start" on a multi-user server, it's about 4 seconds from splash page to the point that Libre is fully rendered and ready for typing. Certainly acceptable. 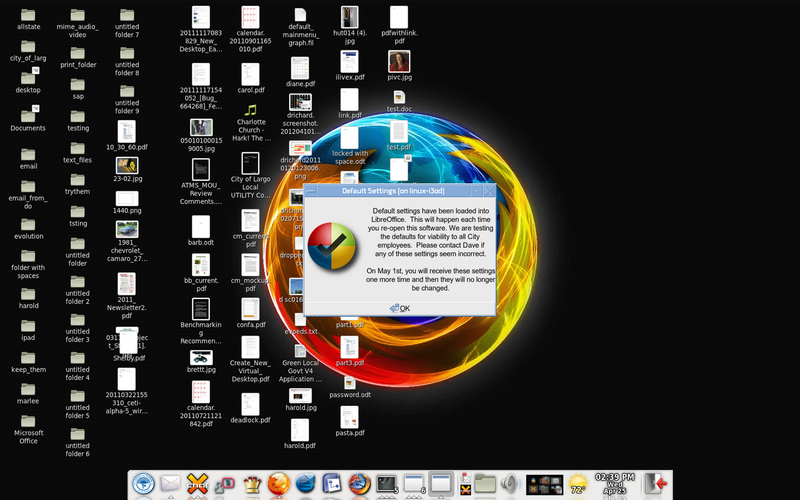 Typing is crisp and responsive over remote display,and users are indicating that it seems to run faster in many places than did OpenOffice. Being that OOo and Libre are on the same physical server, it certainly is an apples to apples test. Both have identical resources, fonts and printers. We have seen some problems with printing tables in comparison to OpenOffice and our support group has discovered some ways to align the tables for better printing. Many of these documents have been upgraded several times going from WordPerfect 6, 7 and 8 and then OpenOffice 1, 2 and 3 and now LibreOffice. It's a wonder they open as well as they do. Once this is deployed, I will be spending some time in some known problem areas. We have seen some performance problems when Anti-Aliasing is enabled for graphic objects. I want to better understand these problems and work with the developers to make improvements. Huh, what are your antialiasing settings? Looks unhinted, but quite sharp. Did you modify FreeType? @Mike: for a number of years we have been teaching users not to use that feature and instead encode the MediaType into their documents. When you use MediaType it stores the type of paper in the document and then sends it to the printer which then automatically sends it to the right tray. If you encode into your document it might be Letterhead but in the future when the printer is upgraded it might be Plain. Also, if you encode MediaType it works with any printer around our campuses and the users don't have to understand their tray arrangements, it's fully automated. @anonymous: I am not a font expert in regards to appearance, but my settings indicate 96DPI/Grayscale Smoothing/Slight Hinting/RGB. 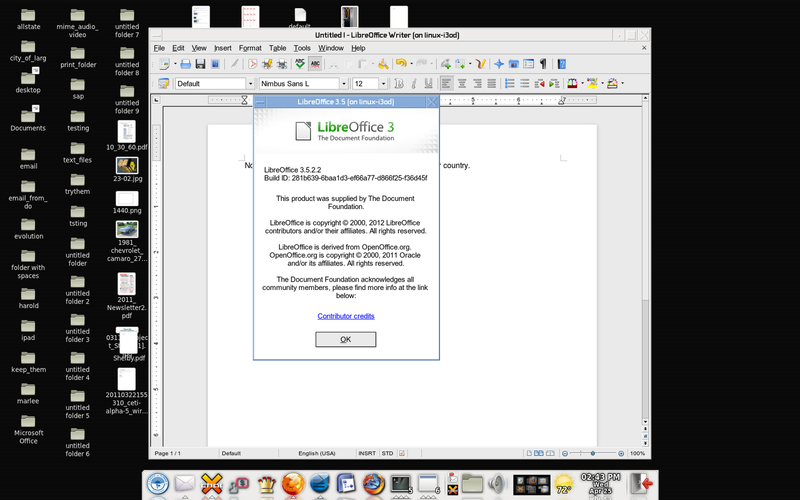 How many of the employees use Libre/Open Office at home? is it 5% 50% or 95%? Any estimates? Because of the nature of Government, most people log in using NX from home and construct documents remotely. So those that do take it home are using it for personal use.